It's quite simply the most fantastic and opulent villa I have had the pleasure to stay in. Imagine… a luxury Algarve villa to yourself for a moments peace and tranquility. Once in a while we get to stay somewhere special, somewhere next to miles and miles of sandy beaches, some of the best golf courses in Europe, in a cosmopolitan, sun kissed location that offers luxurious, contemporary accommodation in a magnificent setting. One of Portugals most prestigious properties, Casa Ferrel is a beautiful and luxurious 8 bedroom villa which was completed to the highest of standards in June 2007 and provides unparalleled, secluded accommodation, making Casa Ferrel the idyllic location for a memorable family holiday, an indulgent break, or as a base for a golfing holiday in the Algarve. Its up there as quite possibly one of the best Portugal villas there is. Luxury Portugal villa, Casa Ferrel is only 50 minutes drive from Faro Airport, situated 6km west of the historic town of Lagos in the upmarket and picturesque fishing village of Praia da Luz, a resort which remains unspoilt and where life is led at a less hectic pace than other resorts in the Algarve. Set in spectacular grounds and on three floors with both indoor and outdoor heated swimming pools, air conditioning throughout, seven bespoke bathrooms / shower rooms, a multitude of large sumptuous public rooms, a gymnasium and games room, an eight seat private cinema, Wi-Fi / Broadband and numerous outdoor terraces and balconies and an additional self contained apartment, this luxury Portugal villa offers something for everyone and is the perfect place to recharge your batteries and enjoy a stress free holiday. Even large parties will be able to relax and unwind in privacy as you can easily lose yourself in the luxurious and lavish surroundings. The fully stocked ‘pay-as-you-use’ cellar makes sure you need never run out of wine either! A maid service is supplied every 2 days except on Sundays, and should you wish, our own award winning chef will come and cook your favourite culinary delights on a day of your choice, or throughout your stay at Casa Ferrel. Whether lounging by the pool, lying on the beach, playing golf, exploring the Algarve countryside and coastal beaches or tasting the flavor of the local cuisine, Casa Ferrel provides you with everything you will need for a relaxing and memorable holiday in the glorious Portugal villa. The villa is stunning and was the ideal location for our group. Great facilities, privacy and a serious wow factor! Set over three floors, it has seven bathroom / shower rooms, private indoor and outdoor pools, a cinema, gym, games room and wine cellar. 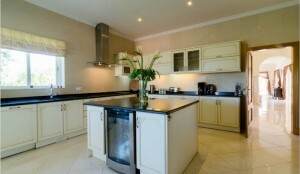 On the garden floor, there’s a huge kitchen with granite detail. There’s also plenty of space in the public rooms, including a formal lounge, TV snug and dining room. Approached by a driveway lined with olive trees, the entrance is reached by twin steps flanked by palm trees. At the back of the house, there’s a large terrace by the 14 x 6m pool with lots of room for sunbathing and barbecuing. Situated between Lagos and Praia da Luz, it’s a short drive from Portugal’s many beaches and golf courses. Restaurants are accessible by car but many families renting the villa have their own barbecues or employ local chefs to cook.